This day there were a few more jeeps about. Some were rushing along at speed, all going in the same direction. Probably to see a kill. That sense of excitement. Check camera settings ready for action. Those of us who share our homes with cats are likely to have experienced their favourite feline proudly parading a dead rodent or bird. We flinch at the loss, but try to feel better by reminding ourselves that it’s nature. And we do love our cats. Of course, if the neighbour’s monstrous moggy happens to eat your pet parakeet you might take a different view. So it is on safari. We come across a big cat chomping at its kill and gleefully film its bloodied face. Whilst we spare a thought for the deceased, we tend to cheer on the cheetah. Generally. Now it was time to witness things from that different angle. Beyond the line of jeeps we could see a giraffe. Just given birth, our guide told us. From many hours watching wildlife programmes, we all visualised the mother standing, calf dropping to the ground then staggering upright ready to suckle. How thrilling. But, not this one. We glimpsed the calf in the long grass. No movement. The mother paced up and down. Walked away. Came back. Still no movement. We could all sense the anxiety. Then there was some movement in the grass. Not far from the calf was a crouching lioness. The giraffe was acutely aware of her presence. Now, so were we. The pacing back and forth went on. The lioness lay in wait. We counted the jeeps lined up: 29, including ours. Watching. Waiting for the inevitable. It was all too much. We left, and so did the mother giraffe. Even if the giraffe calf had survived the birth, the lioness was ready. Yes, the lioness – and any cubs – would get a lovely lunch. But what of the giraffe? The mother had spent 15 months in gestation; her calf had lived less than 15 minutes. Truly, ‘Nature red in tooth and claw’. I love giraffes and couldn’t help feeling terribly sad about what we’d seen. We all did. But what made the death of the new-born even worse, were the occupants of the jeeps. All leaning out, looking on, cameras clicking. Surely this human presence could only deepen the giraffe’s despair? Anyway, why would you want to watch? Yet, for some, it was a highlight. We opted for happier family sightings. Back at Speke’s Camp that evening we discussed the line of jeeps with our host. She agreed. 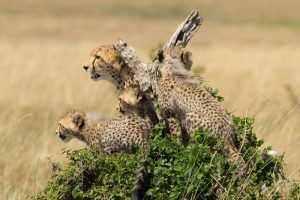 The Maasai Mara National Park is a fantastic place for spotting wildlife. 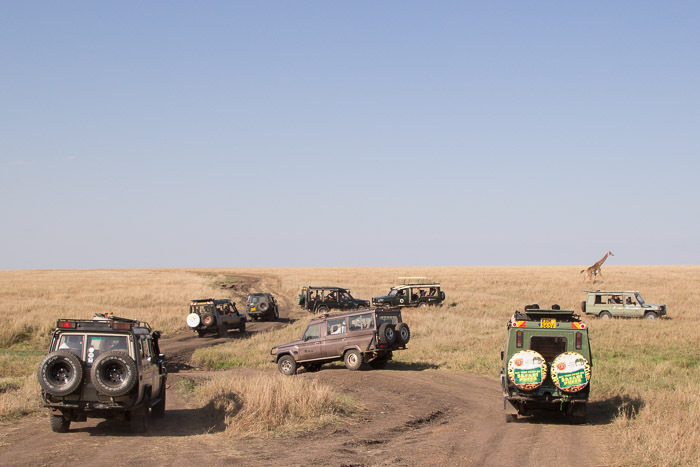 But unlike in the private conservancies, there’s no limit on how many jeeps can queue at a kill. At times it is too much. The speed of some jeeps is an issue too. Park rangers do stop speeding jeeps and fine the drivers. But… certain tourists have been known to press the drivers to speed, and they promise to pay the fine. To stop this, a new rule has been introduced. Any driver caught speeding twice gets banned, and the jeep confiscated, for 3 months. Let’s hope this stricter penalty works. Tourism brings many benefits, but it does need controlling. Many tourists come to this area for The Great Migration. It was towards the end of the migration when we were there, but we were told we still might see some action. 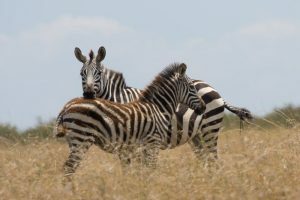 We came close to seeing some zebras cross the Mara River, but indecision got the better of them. To be fair, given the crocs waiting in the water, I could see their point. The migration hasn’t followed its usual pattern this year, apparently due to changes in the weather. For which we humans might be to blame. We humans are also to blame for the huge plumes of smoke we kept seeing in the distance. We were told these were fires, in neighbouring Tanzania, that had been started on purpose. Burning the dead grass encourages new growth which tempts the animals to defer their migration. Or so we were told. This in turn attracts more tourists. The fires cause huge damage and kill off many smaller animals, insects and birds. If it is being done to alter the migration, that’s bad news. At least for now, tourism is bringing major benefits and that really does help conservation. 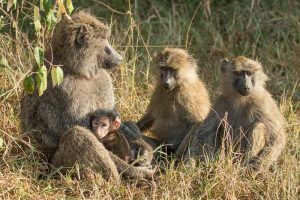 The private conservancies certainly seem to be doing a great job. There are limits on how many tourists can stay in the lodges and a maximum of 5 jeeps can line up to view a kill. Apparently, this is strictly enforced. A good example for other parks, perhaps. 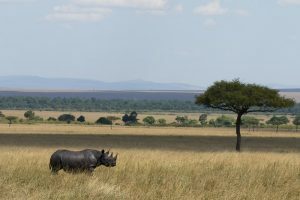 We did visit a conservancy – the Mara Triangle – in search of a rhino. It was interesting to see the different and very expansive landscape. There weren’t many people about or, it seemed, any rhinos. We had just given up our quest and driven away, when our guide looked back and spotted a rhino. The Conservancy kindly let us re-enter and we spent a while watching the rhino having a quiet walk. We felt very privileged to be so near this rare beast. 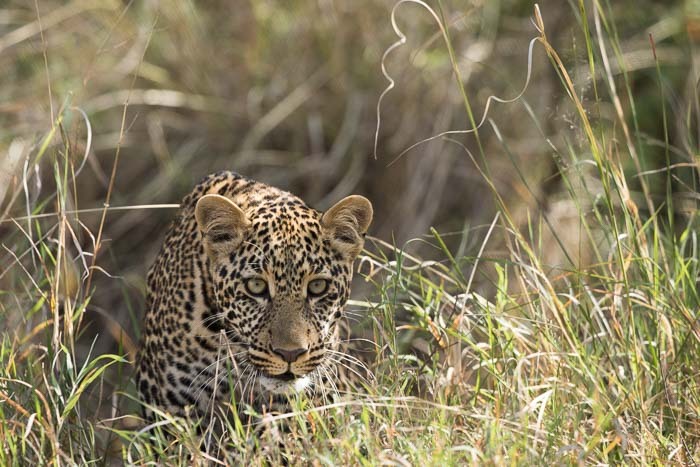 Then we returned to the main park to track yet more leopards. Again, we succeeded and even saw two mating. We had already seen Thompson’s gazelles mating and lions too. It was an action-packed holiday! Mating lions are most entertaining. The main event lasts 20 seconds and happens about every 20 minutes. In between, the lion affectionately pats and paws the lioness. In return, she looks bored and grumbles a lot. Still, maybe the lion’s efforts will pay off. Adorable cubs could emerge to enchant next year’s tourists. Something else that’s wonderful to watch – unless they’re feasting on a giraffe calf. So many great sights and sounds to add to our memory banks. The Maasai Mara truly does live up to its reputation. 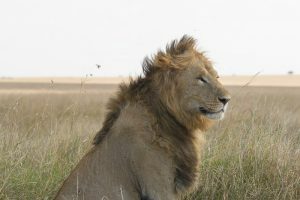 Huge thanks to Harry Nixon at Imagine Africa (www.imaginetravel.com/imagine-africa) for putting together a great trip. Speke’s Camp (www.spekescamp.com) is highly recommended and our spotter and guide were both exceptional. Angie, Bernie and Sue were quite good company too! Love it and loved the whole trip – the giraffe experience was profoundly upsetting and as you say, made more so by the blood thirsty humans crowding around to get a picture! But that was just one afternoon there were many other special days and special sightings. Another good piece – thanks Alli. Wonderful insightful article and beautiful photographs, thank you. Thank you for sharing this with me, I also loved it. You managed to bring the trip to life so much that I wanted to be there and have awaken my desire to go on another safari – very soon. I also thought you photos were exceptional and loved the rhino one in particular – great balance. Thank you again and I look forward to your next piece. What a wonderful account of your trip- and very thought provoking in some parts. The pictures are especially lovely. Fabulous experience and article Allison. I’m not sure I would have been able to watch the giraffe calf event.